Starting today, music publishers and songwriters will have a brand new source of revenue. Google has signed a multi-year licensing deal with Toronto-based LyricFind to display song lyrics in its search results, both companies announced today. A query for the lyrics to a specific song will pull up the words to much of that song, freeing users from having to click through to another website. Google rolled out the lyrics feature in the U.S. today (June 27), though it has licenses to display the lyrics internationally as well. While the terms of the deal weren’t disclosed, LyricFinder Chief Executive and co-founder Darryl Ballantyne projects publishers and songwriters seeing "millions" of dollars in additional revenue from this arrangement. "It should be a significant revenue stream," Ballantyne said. "I can’t get into the rates, but we expect it to be millions of dollars generated for publishers and songwriters as a result of this. It’s all based on usage. Royalties are paid based on the number of times a lyric is viewed. The more it’s viewed, the more publishers get paid." by way of explanation - i was just bitching about bing using lyricfind and putting up errors - in their case, they had the lyrics to tears for fears' song shout, credited to the isley brothers. the isley brothers also wrote a song named shout - with completely different lyrics. it should be noted, tho, that bing was well ahead of google on this one, as they've been including lyrics from lyricfind with search results for several months now. When I saw this article in my feed this morning the first person that I thought about was you and your "Shout" situation. 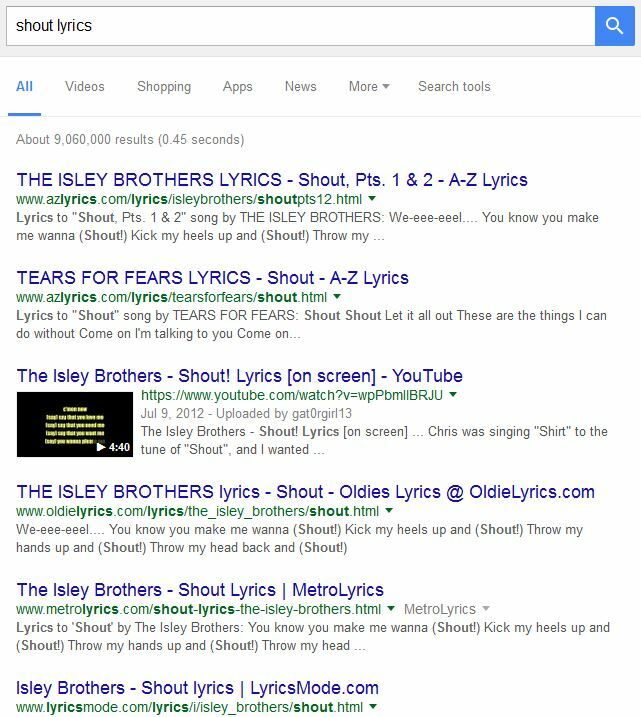 Interestingly, if I search Google.com for 'shout lyrics', I get mainly Isley Brothers results, like this. 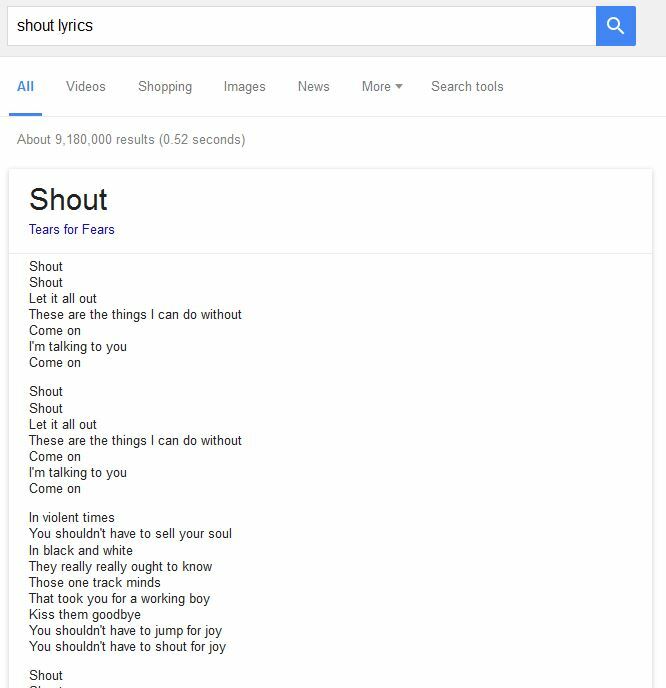 If I search Google.co.uk however, much more of the results are for Tears for Fears and Google is now displaying the lyrics for their song by default, like this.